When sewing or crafting at times you may end up using glues or other substances with strong odors. You will also find yourself from time to time having to deal with lint particles from fabric or other materials. Your loveable dog or cat may also end up keeping you company while you work. When this happens, you will need a solution to maintain the quality of the air you are breathing in. An air purifier is able to answer this call. 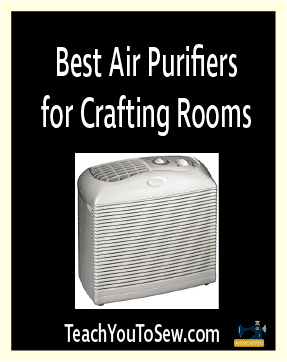 To help you make the best selection, I have put together a list of the top six purifiers for your crafting or sewing machine room. This allergen remover filter has a branded HEPA replaceable filter which removes germs from the air. It comes with a double pack of replacement filters which only need to be changed once a year. This allows it to function at its optimum and ensures the best air quality for you. 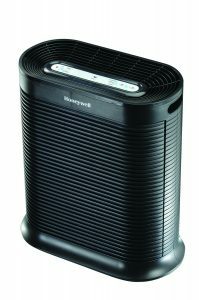 This model also has an activated carbon pre filter which absorbs any odors and keeps the air smelling fresh and crisp. This machine effectively handles a 465 square foot room and circulates the air five times within an hour. It has indicator lights which tell when to check the pre filters and also when the machine needs cleaning. This purifier is so effective that it is able to capture 99.97% of particles which are 0.3 microns and larger. This model has a similar filtration capacity to the Honeywell but the filter needs to be replaced more often. It also works in combination with a charcoal filter for odor absorption. Every 6 to 8 months is the recommended replacement frequency. The manufacturers recommend using only genuine Guardian replacement parts. This will ensure that the machine remains under warranty. This tower model stands 22 inches high and operates at three speeds to cover the room. It makes use of UV-C light technology to kill germs and bacteria. This model is best suited for medium sized crafting or sewing rooms or smaller. The multi- layer filtration system makes is super effective at capturing various particle sizes. This tower purifier removes allergens and particles as small as 0. 01 microns from the air. It uses electrostatic technology instead and this eliminates the cost associated with replacing filters. To clean, simply open the top of the tower chamber and lift the dust collector rod out. Wipe it clean with a damp cloth and it is ready for use once again. I like this cost saving feature which also environmentally friendly. It has two fans speeds and the dimensions are 17 x 6 x 7 inches. An additional feature it has is a night light. An ac adapter power cord is included with the purchase. This model has an ion purifier air filter which never needs to be changed. The filters are made of stainless steel and can easily be cleaned. To remove germs and bacteria from the air this purifier makes use of ultra violet light. This UV light kills 98 % of the germs in the air. It is ideal for spaces 150 square feet and smaller and the dimensions are 10 x 5 x 4 inches. This makes it very lightweight at 1.2 pounds and all you need to do is plug it in. If you have a small sized crafting or sewing room this is my recommendation to you. This model like its counterpart has a filtration rate of 99.97%. Where I give it the edge is the addition of the new technology. The Pet Pure technology uses an antimicrobial substance added to the filter which kills the more resistant mould and mildew. It also kills the regular germs and odor causing bacteria. Further odor elimination is provided via the charcoal filter which works along with the HEPA filtration system. This model uses the same UV-C light technology to zap the germs and bacteria. It measures 28 inches tall and operates at five different speeds to purify the room. It comes with a 5 year manufacturer’s warranty and the device indicates when the filters need to be changed. The changing frequency is every six to eight months. This air purifier is ideal for medium to large rooms and has a timer which can be set for up to eight hours. This air purifier uses a combination of the Fine Preliminary, True HEPA and Activated Carbon filters. Please note that the HEPA filter comes enclosed in a plastic bag, which needs to be removed prior to operation. Failure to do so will result in damage to the machine. It operates at a low, medium and high setting and also has a light with two levels of brightness. It has a compact design and is best suited for smaller crafting or sewing rooms. It does not use UV technology to kill germs, which is a safe option for the environment. The filters need to be changed two times in a year. 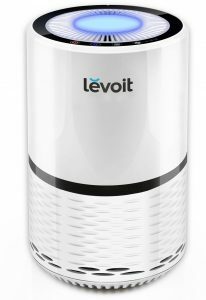 The customer service support you will receive for the air purifier from Levoit spans its lifetime.